Zika outbreaks are occurring in countries throughout the world. Travel-associated cases have been reported in the U.S.
X-Plain's video and interactive tutorial on Zika virus can help you learn the symptoms and complications of the disease, treatment options, and how you can protect yourself. X-Plain also offers Spanish-language versions of these resources. X-Plain is a trusted source for accurate, evidence-based education on infectious diseases and other health topics. X-Plain has been reviewed by practicing physicians. Contact us today to license X-Plain’s Zika Virus tutorial, video, or print handout. 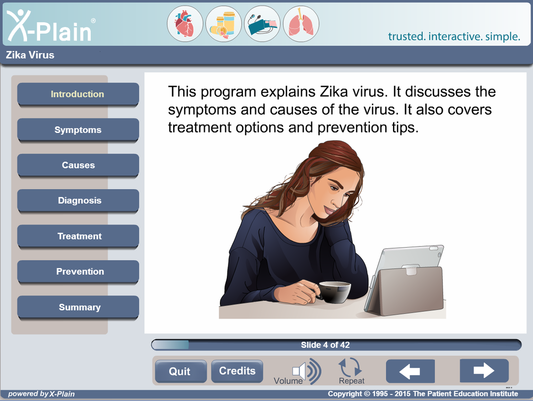 In addition to Zika Virus, X-Plain offers videos and tutorials in English and Spanish on more than 1,500 health topics. X-Plain programs integrate with EMRs, patient portals, tablets, smartphones, and hospital bedside TVs.